The traditional way of designing something is to create a 3D model in a CAD system, subject it to loads and boundary conditions in an analysis software, study the results and tweak the design. You do this till you are satisfied with the outcome and then go build a prototype to test the design in the physical world. A company called solidThinking (acquired by Altair in 2008) has a software product called Inspire which does this the other way around. You basically start with an initial “design space”, apply boundary conditions and loads, set some design parameters and the software comes up with a design for you. Let me explain this with a simple example. The image below shows a maroon box between two grey plates. The bottom plate is anchored to the ground and the top plate has a force applied to it in the horizontal direction. The box represents the “design space”, which is basically the space that Inspire has been given to create the design in. This is the design Inspire came up with. There is always more than one way to design something. When you have a good start point you have a better chance of ending up with superior design faster with lesser iterations. Let’s play around a bit with this example. Say we need to make place for something else that needs to fit in the original box design space. Let’s reduce the design space by removing part of the box. This is done in Inspire using push pull style direct modeling. FYI, the translucent red place is a symmetry plane which I used to tell Inspire that whatever design it comes up with must be symmetric about that plane. I told Inspire to do its thing and it came back with this design. This kind of a design methodology is called digital morphogenesis. Digital because we use computers to do it. Morphogenesis because that’s the way life itself evolved. By changing shape to adapt to its surroundings. Inspire gives you a number of parameters to configure your design optimization runs. Recently solidThinking released version 9.5 of Inspire which added a new design objective. You can maximize stiffness or minimize mass. You can specify how much of the design space you want Inspire to play with. In the example above, I chose 10%. You can even set constraints on frequency and thickness. In the example above the design space was a 1 meter cube and I didn’t want the design to have a member that was less than 10 centimeters. I subjected a single force and didn’t factor gravity. But you can add multiple loads, pressures and torques and organize them into separate load cases to test different scenarios. Here is the design for an armrest from Inspire gallery. I particularly like the user interface of the software. Its clean, intuitive and well thought out. Take the toolbar for example. You can initiate multiple commands from the same tool by clicking on different areas of the tool’s icon, as can be seen from the image below. Hovering the mouse over the tool highlights parts of the icon. If you hover long enough you will get a tool tip explaining which command will be initiated if you click that part of the icon. The software comes with a basic set of tutorials which are written in a nice way. Each lesson is broken down into various sections. Each section starts with a video which is then followed by the detailed step by step instructions with screenshots of what was shown in the video. So you can choose to complete the entire tutorial to see the output or watch the videos. Inspire works on Windows as well as Mac. Unfortunately you can’t go ahead and download a trial from their web site. You need to request it from here. solidThinking Inspire is available as a standalone product priced at $6,495 (node locked license) or %7,995 (networked license). 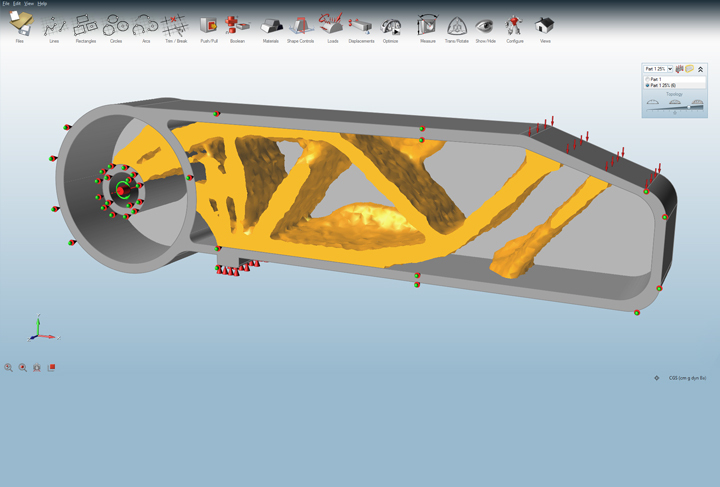 It is also available as part of Altair HyperWorks.